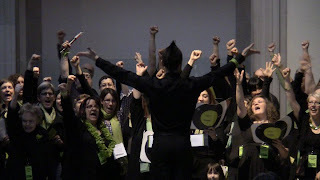 On the day we all woke up to yet another beautiful but unwelcome blanket of snow Harbourfront Centre brought their Complaints Choir to the Art Gallery of Ontario. The weather was one of the many concerns in the list of complaints elicited from the Toronto community since last fall. Over 1000 were received and World Stage resident composer and lyricist, Bryce Kulak, whittled them down to 60-odd rhyming gripes set to a tune catchy enough for a novice singer to proclaim. While handing out the lyrics sheet to the patrons of the AGO, I overheard a parent predicting their child would be humming the song in the car the whole way home. And indeed, choir members confess to whistling the song at work leading up to tonight’s performance. Originally conceived by Finnish artists Tallervo Kalleinen and Oliver Kochta- Kalleinen, this community art project has seen successful compositions in Birmingham, Chicagoland, Tokyo and Jerusalem. Many of their performances have been documented and can be found online, as well as on the Harbourfront Centre website. The pleasure of a good bellyache doesn’t discriminate as reflected by the diverse members of the Toronto Complaints Choir. Young and old, many communities were represented and while the group boasted more women then men, Bryce Kulak successfully maintains his duty as conductor while leading the vocal sections set aside for male voices. Bringing the Complaints Choir into community spaces is at the heart of this project as it alters the way we encounter our city and the people in it. As the choir entered the Walker Court there was already an audience waiting but when they began singing people flooded the balconies to see what all the kvetching was about in the otherwise hushed gallery. The validation of hearing complaints experienced by many of the people in the audience set to a feel good tune is intoxicating and moved one excited listener to dance, clap and sing along. After it was all over, as I was waiting with the few crates needed to perform this show, an excited woman asked if I was involved with the choir. Thrilled this event was happening, she figured she had enough complaints she should run for Prime Minister. 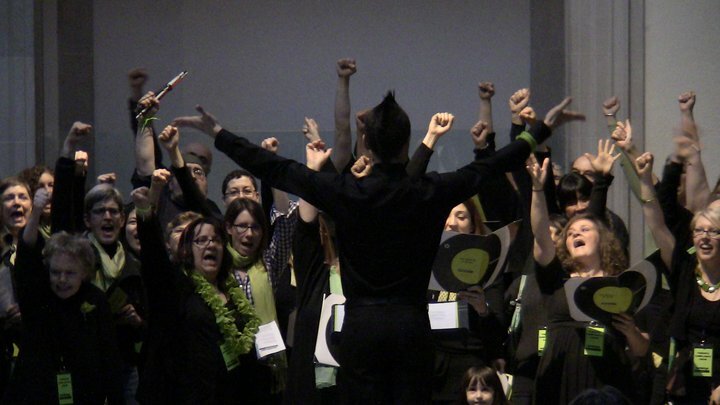 If the snow and the prospect of a spring election in Canada are getting you down there are two more chances to catch the Toronto Complaints Choir this week: Thursday from 6:30 – 8pm in the Distillery District and on Saturday from 3:15 - 3:45pm on the boardwalk just south of Harbourfront Centre. I had very little fortune in catching a performance of the Choir this week and therefore will share my limited comments here as opposed to writing an article response. The gods were not on my side as I raced through Toronto traffic to reach the Distillery on a Thursday evening. I arrived to find the choir in the last 2 verses of the song, which I thoroughly enjoyed for all of 2 minutes before they finished up and without a bow raced into the Balzac’s café for a much needed hot chocolate rescue from the cold. What I will say is that the presentation of the choir was very effective. They had a real impact upon the open space of the Distillery. Perhaps this was the size of the group or it was their powerful voices. They had even incorporated some choreography into the song giving them a sort of gospel feel. Looking at the lyrics on the page I think it’s clear that many of the complaints came from people with a very similar political bias. The exclamation of Rob Ford’s name and G20 as a police state resonate strongly for someone like myself… an artsy, left of centre young person, but what about the many other views in this city? Was there a complaint against bicycle routes? A complaint against the Transit City project? Probably not, or at least not one that Bryce Kulak decided to put into the composition. I’m not trying to put a damper on what was a really comical piece of performance. It’s important to reflect on the complexity of these complaints, some more than others of course. I think it becomes easy to always enjoy work by those who share the same values. I certainly had much to complain about in trying to actually see this show. In the end it was reassuring to see it and to feel a sense of connection, to know that we’re in this together, well some of us, even if just for a moment. I loved being a part of the choir. It was a great experience of community and I thought it was fantastic to do flash-mob performances around the city. People were genuinely caught off guard and seemed to really respond to the experience. I think it was a fantastic way to bring together a diverse group of people from across the city, and to engage the public in a creative and harmonious way. I'll definitely be back for the reunion tour. It was unfortunate that I was unable to participate in the collective creation process which I suspect is the gold of the Complaints Choir phenom. I caught the closing performances at Queen's Quay, first (performed in quasi-exile from the mall) outdoors and then (with Habroufront Centre intervention/mediation) in the belly of the south atrium. Both were full of spirit and received in good humour by a celebratory crowd. At the end, we were all handed a small package of seeds (which I interpreted as), an invitation for laudatory audiences to find ways to transcend 'complaining'. I recently planted the seeds and each day that I look upon the lush (albeit overcrowded and competing) verdant cluster of sprouted tendrils that resulted, I am reminded of how we live in Toronto (in any densely populated city for than matter). Like an cave dweller, I am grateful to be in the company of others with ambition for light. Like any community (of which a common intention unifies) may this always come with viable and companionable difference.